I know. Who am I and what have I done with Loretta? It all started last semester as a stress reliever. I’d head over to Yates Field House and run on the treadmill for a little while when I’d get really stressed out about a test or paper (honestly it was another form of procrastination, but we’ll just say it was for my mental health). Then winter break came and I had two months to kill. Why not run? I decided that I would try to keep up my new habit when I went to Chile. Upon arriving, I was so excited to have the opportunity to run in warm weather (January is VERY cold in Pennsylvania and more often than not discourages any sort of outdoor activity) that I just kept it up. It has been a great way for me to get to know my neighborhood. I find new and exciting looking restaurants and sites every time I lace up the sneakers. Now, my initial goal when I started running was to enter the 10K at the Marine Corps Marathon in October when I return to Washington, DC. That way I’d have something to work toward. However, one day I Googled “races in Santiago” just for kicks to see what I could find. 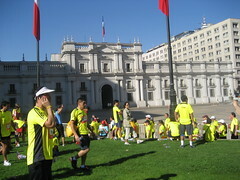 As it turned out, the Maratón de Santiago (Santiago Marathon) was going to be in April and a 10K would be one of the events. After a little deliberating (was $25 really worth it? Then I saw that I would receive a shirt with my inscription. My decision was suddenly very easy. ), I decided to enter. I started running more regularly to prepare myself. A few weeks before the marathon, my knee started hurting every time I ran. Even after taking some time off, the pain just wouldn’t go away. The day before the race finally arrived and my knee was still killing me. I made the heartbreaking but seemingly necessary decision that I wouldn’t run in the race (heck, I could barely walk). But I had paid my $25 so I was getting that shirt. 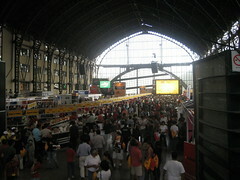 Shirts and numbers were being handed out at Expo Maratón the day before the race, so I made my way to Estación Mapocho, an enormous former train station that now acts as a cultural center. 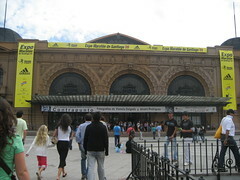 The outside of the building was covered with banners and inside it was packed with eager participants. The whole thing only made me more upset that I wasn’t going to be participating. I picked up my number and headed over to the shirt stand to pick up my gloriously obnoxious yellow shirt. Interesting fact: women don’t really seem to be into sports in Chile. I noticed when I was running around my neighborhood that I often passed other runners, but they were usually men. The marathon was no different. I walked past at least six stands giving out men’s shirts, each doling out a specific size, to the lone stand giving out all of the women’s shirts. I picked up my new favorite article of clothing that I wouldn’t get the chance to wear and made my way home. Along the way, I decided that I wasn’t going to miss out on all of the excitement of the marathon just because of my stupid knee. This year marked the third year of the Santiago Marathon and, with 16,000 participants in three distances (10K, 21K, and 42K) it was going to be the largest marathon in Latin America. There was no way I’d be missing that, even if it was just as a spectator. So the next morning, I got myself up at 5:15am, had some breakfast, donned my delightfully yellow shirt, and headed for the Metro, which was being opened an hour early for the marathon. From the minute I stepped into the station, the excitement was palpable. Everywhere you looked you saw yellow. When I finally arrived at La Moneda (the presidential palace and starting point for the marathon), the sea of yellow was overwhelming. At this point, the excitement was too much to bear. I’d be able to run 6.2 miles today, right? My knee didn’t hurt THAT badly…I hadn’t even limped all morning! And besides, there were so few women participating that I just couldn’t let that number dwindle any more (Helen Reddy’s “I Am Woman” may or may not have been stuck in my head at the time). My decision was made. I was gonna do it. It was one of the most exhilarating experiences of my life and I’m thrilled that I decided to go for it. I got through the whole race virtually pain free…oh, the power of adrenaline. On my way home, as I walked down my street (well, more like limped down…the adrenaline had worn off at that point), two different people pulled over to ask me which race I’d run and how I’d done. I stopped in a pharmacy and the man in front of me in line and the pharmacist both asked me all about the race. I was really impressed by how friendly and excited everyone seemed to be about the marathon. My knee may have gone on strike against me over the last week, but I’d do it all over again in a heartbeat. I loved the adrenaline rush so much that I looked into entering other races while I’m in Chile and I’ve signed up for my next one. I’ll be getting another shirt –this time it’s orange. Congrats!!! 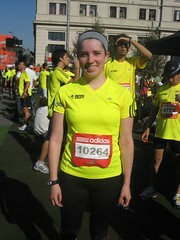 It must have been an amazing experience to run a race in Chile. I had a similar experience in Spain, where I would run because I enjoyed the sport. However, in Spain many people run as a way of competing against each other, something that I had to explain to many people as to why I wasn’t competitive when it came to running. I hope your knee heals soon!